A year older...a year wiser! Is it the safe way to light up? This was a long overdue post. 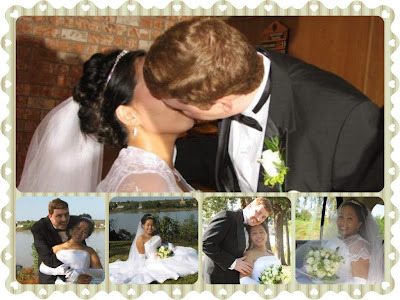 I haven't had the chance to talk about our 6th wedding anniversary in the U.S. which happened last month. We were married for the first time in a small Christian ceremony in Arkansas in 2007. I said for the first time because two years after that, we eventually got married in a grand Catholic wedding in the Philippines. But that's not what this post is about, lol! Many may have known that our love story was one of those precious, time-tested long distance relationship. We endured the hardships and struggles brought by a long-distance, 2-different culture love affair. But we made it this far, don't we? I think it's just sweet to reminisce those early days when we were together. And one special part of it was our wedding. I am just grateful to God for giving us each other. Surely, the road wasn't all smooth and straight but that's how it will make your love stronger and your relationship deeper. And after 6 years of being together, we now have an exuberant 3-year old, lol! so it's a great blessing. 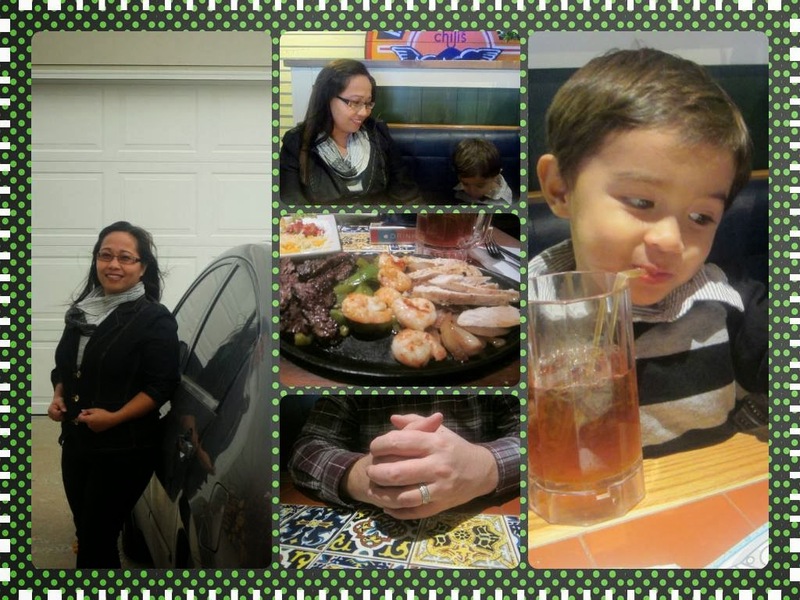 All three of us went out and have a nice dinner at my favorite chain in town, Chili's. It was simple yet wonderful because I was with my two favorite persons in the world. Below are some of our wedding photos. People would say when you're truly happy, it radiates in your aura. When I look back at these photos, I can honestly say that we do look happy and content with each other's arms. Thanks for reading! 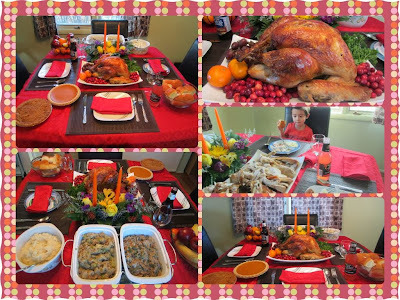 Happy Thanksgiving Day...From our family to yours! I hope everyone had a wonderful Thanksgiving dinner. I love holiday celebrations but would prefer to keep everything simple and easy as far as meal preparation is concerned. Well, we wanted to have a whole turkey this time. We’ve had turkey breast before but I thought it would be a nice new experience cooking-wise if we would try a whole bird. So that’s what we had last Thanksgiving dinner. I have scoured the web for a good roast turkey recipe and I decided to give Alton Brown’s recipe a go. His recipe involves brining which was cool because I really wanted to try that. However, two days before Thanksgiving I have talked to my sister and I decided to follow her method of brining instead, lol! So anyway, I love how the turkey tasted. I could not believe how much difference brining does to the roasted bird. It was just amazingly juicy, tender and delicious. Our dinner was quite simple and small. After all, it was just the three of us anyway, which was just as well because I didn’t think I’m ready to host a big dinner for friends and family, lol! I’m not really good at it even back in the Philippines. I hardly help as far as preparing food on Christmas and New Year, lol! I just thought it’s too much hard work. But now that I have a family of my own, I thought it would not be fair for my little guy and husband if I wouldn’t at least try to make a nice dinner for the three of us. It wasn’t that bad actually. I had some help from hubby and we were able to eat at a decent time. We were quite stuffed right after the meal. We were nappy but we chose to watch a movie on Netflix instead. It was a lovely, relaxed holiday for the three of us. Looking forward to Christmas now! Speaking of Christmas, have you done your shopping yet? As of this writing, I am actually drooling over the idea of hitting the mall right after work today. I’d like to take advantage of the huge Black Friday sale. I am not sure what to get for hubby yet but with the huge selection of cool items in the store, I’m pretty sure I will find something that he might like. Sometimes the presentation of the gift matters, lol! I mean a couple of years ago, I got a nice gift set from sister-in-law. The gift bag was a gift itself. I mean it just looked gorgeous. So yeah, every little detail counts. I have been checking out burlap gift bags here and I must say I really am tempted with the idea of getting one to stuff my Christmas presents in. They’re simple yet classy. Not to mention it would save me some time from gift-wrapping which I must admit I’m not very good at. Using a gift bag just sounds so simple and easy. We just celebrated our 6th wedding anniversary and I was glad that my favorite store has a better selection this time as far as gift ideas is concerned. I was able to score a great deal on a nice racheting screwdriver set for hubby. I will start my Christmas shopping real soon and I’m thinking of getting some tools again for hubby. He’s a handyman and I’m sure he’d appreciate tools as gifts so I’m giving him that, lol! After I turned 29, I kind of quit paying attention as to how old I am, lol! I still do look forward to my birthdays though (6th of Oct) just because I am lavished with gifts and love by hubby and my family in the PI. This year is no different. I woke up to a beautiful bouquet of pink flowers, a card and a nice bake ware set from hubby. 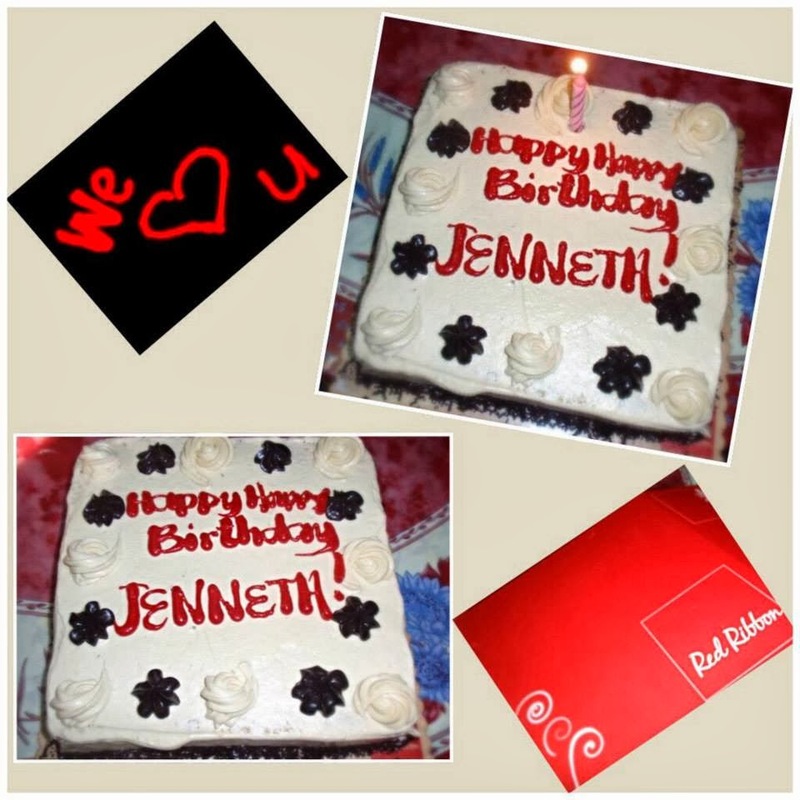 Then when I went online on Facebook, I was surprised to see that my family have taken the effort to buy a nice cake from Red Ribbon to celebrate my birthday. That was really nice of them to do that. We may be miles apart but their love for me simply shows. I miss my family very much. My birthday wouldn't be complete without hubby baking me a cake, lol! Nothing fancy but I appreciate the effort so much. He does that every year so we can simply call it a tradition in the Lord's household, lol! This year was fun because my little booger was the first to devour the cake. It's as if it's his birthday, lol! 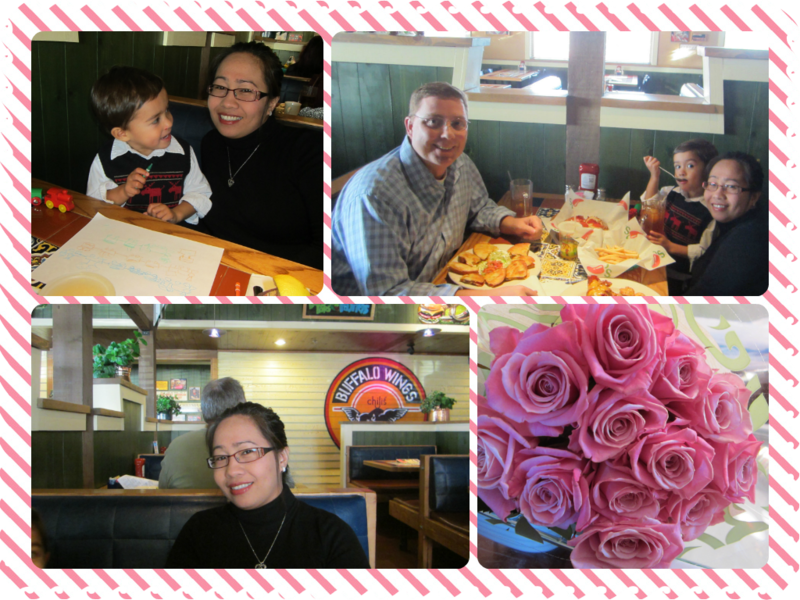 It was just really a simple celebration but it means a lot to me because everything about that day showed how much I mean to my husband, my kiddo and my family in the Philippines. We concluded my birthday with a nice family dinner date at my favorite restaurant Chili's. :) What else could I ask for, right? I mean it was indeed a perfect birthday for me. I consider October as my favorite month. It’s because I get to receive gifts from hubby twice, lol! Aside from my birthday, our U.S. wedding anniversary falls on this month as well. So it’s practically like a prelude to Christmas for me, which is pretty exciting, don’t you think? Just today, I did my shopping for anniversary gifts for hubby. I’ve always found it difficult to get something for him. Not because he’s meticulous or picky, but actually, it’s the contrary. He’s too simple I guess. Even just the right kind of book would make him happy. But I didn’t want to just get him a book, I wanted something special, fun and personal but it’s hard to pick the right choice. Sometimes I wish hubby smokes because that would probably give me more gift ideas, lol! I saw some cool lighters in the store today that I would have bought for him if he had been smoking. But of course I can’t get him that because he had quit smoking ten years ago. Not that I’m complaining, don’t get me wrong. I’m not sure if I’m okay with the idea of him smoking in all honesty. I don’t like the smell of cigarette smoke to be honest. It feels like it constricts my breathing. So I think it works perfectly that we both don’t smoke.